With a gun in your hands, you are guaranteed of both defense and protection. From pistols to AK47s, rifles to revolvers, each showcases a different design but serve one purpose. 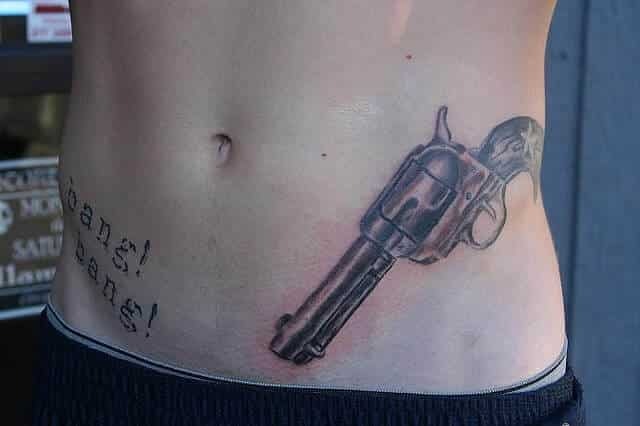 If you are a gun enthusiast, an excellent way to represent your outlaw ways is to go for a gun tattoo. This article will introduce you to gun tattoos for men, what the tattoos mean, and why they are popular amongst men. 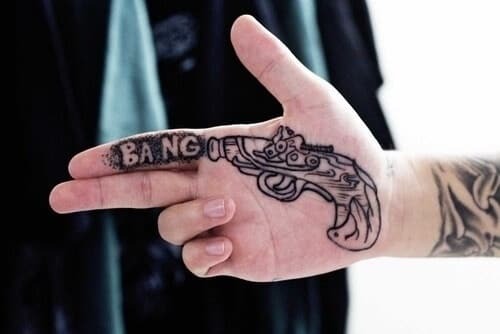 Depending on the creativity of the tattoo maker, gun tattoos can be designed in many ways. You can make your gun look real, cartoonish or even artistic. You can also choose to get a revolver, a pistol or an antique gun for a tattoo. If it suits you, you can also keep your gun tattoo in monochrome, make it colored or even add other embellishments. As per now, pistols are the most preferred tattoo design because of their small size and the ability to fit in almost any body part. Machine guns, rifles, and shotguns can also be used as men gun tattoos, but they are highly preferred by army men. Globally, the rifle is the most common gun tattoo among the armies. When it comes to which body part you should tattoo, the choice still lies with you. 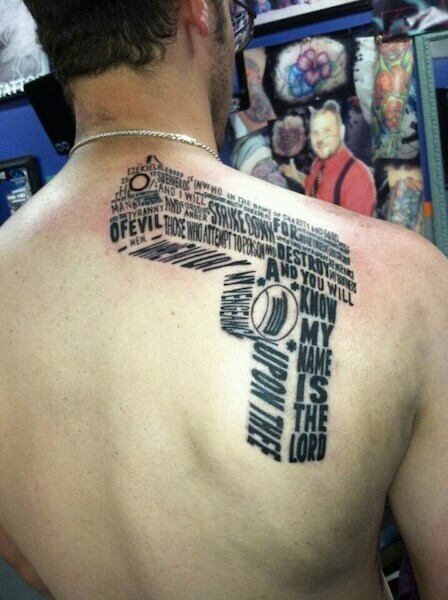 Nevertheless, the most popular locations for gun tattoos include sides, arms, legs, and back. Another famous location is on the sides of the stomach below the ribs. Most men love gun tattoos because they are often associated with heroism and bravery. As a result, gun tattoos are mostly preferred by men who deal with guns regularly, for instance, army men, policemen, hunters, and the general public who use guns for different reasons. Since guns have been weapons of criticism right from their invention up to date, some people believe that gun tattoos are associated with negativity and violence. However, most men associate them with courage, power, bravery, and freedom. Gun tattoos can also be used to represent an enemy who hurt you most. You can also use them to symbolize military service as well as wartime. Some of the most common gun tattoo meanings include authority, protection, danger, vengeance, strength, evil, and honor. The meaning doesn’t have to be negative always. Men make gun tattoos for either symbolic or personal reason. 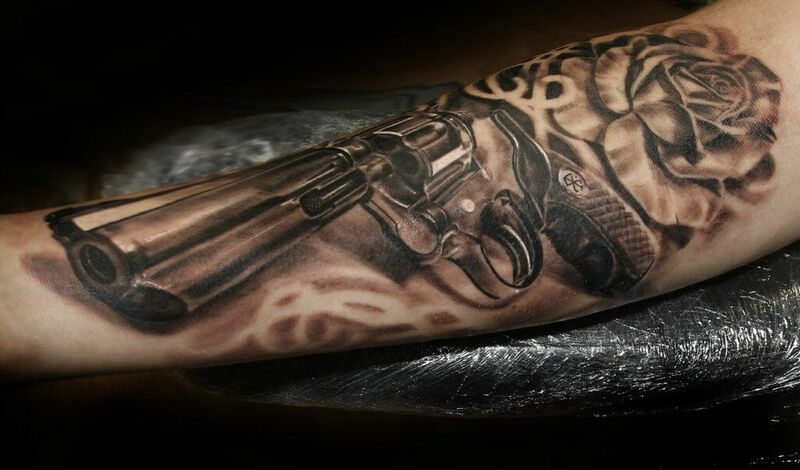 When done by an experienced tattoo artist in an artistic way, gun tattoos look absolutely amazing. Before going for a gun tattoo, take some time to think and research extensively about the different gun tattoo designs for men. Before reaching a final decision to acquire one, ensure you have a clear idea about the symbol, what it represents, and its meaning. This step will help you to settle for a gun tattoo that symbolizes yourself and represents your true personality. Do not rush before thinking because you might get something that you might later regret. 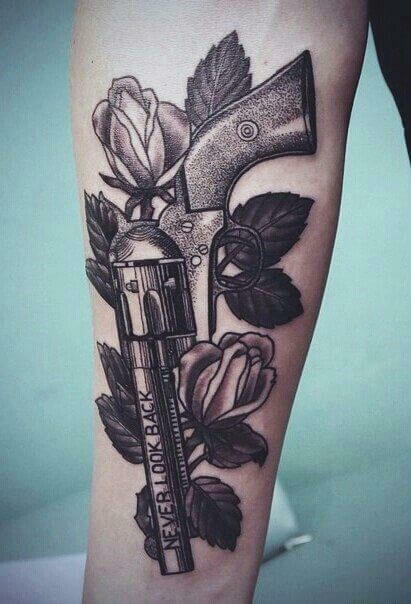 There is nothing that says a good gun tattoo like a classic design. They are called classic for a reason after all. 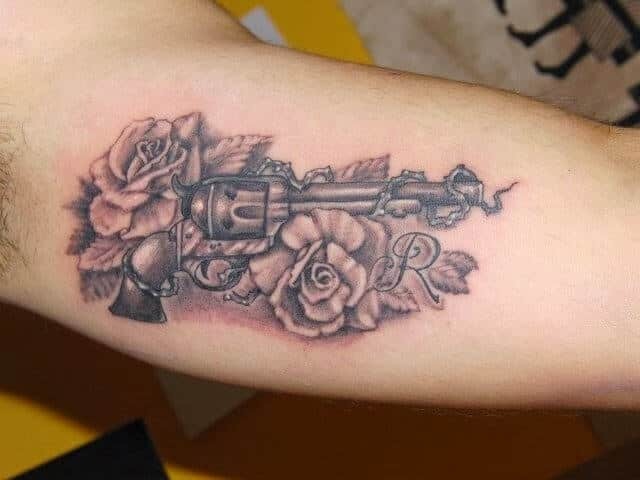 Nothing shows off your love for firearms like a couple of roses wrapped around a revolver. The phrase “Never Look Back” lined across the barrel is sure to let people know the kind of person you are. This is a more modern design for fans of letter art, and fans of cinema alike. We all remember Sam Jackson’s famous phrase from Pulp Fiction, and this tattoo goes to show how great it looks like a tattoo. This letter style is a sure-fire quality gun tattoo for men who want to show off their moxie. 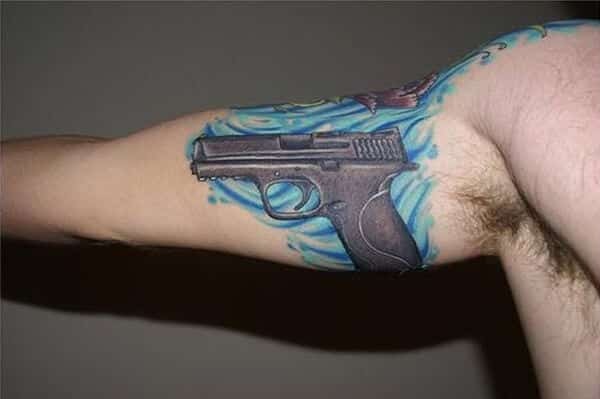 This one is a little unorthodox, but if you are looking for good gun tattoo ideas, no one said you had to be a run of the mill guy. Show off your lighter side with this design, as you can assure you will be the talk of the party when you raise your finger and point a BANG! In someone’s direction. 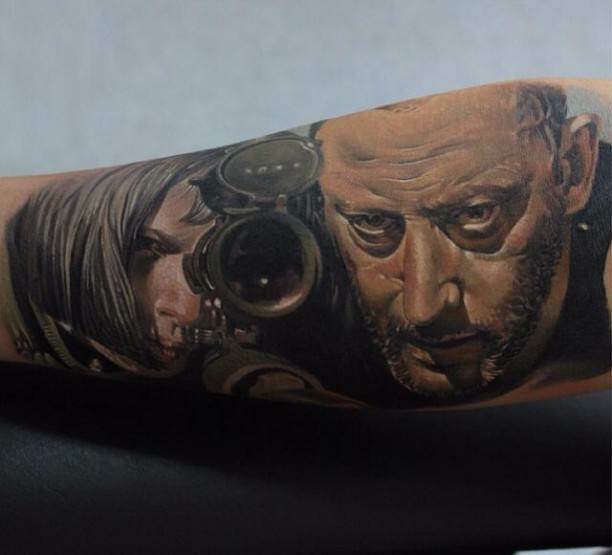 Everyone loves a realistic gun tattoo idea. Getting a gun tattoo where you can see the grain of the handle may be one of the best decisions you can make when picking out your design. Like other designs, this one features classic roses to ensure that people know you mean business when it comes to beauty. Looking for something that is true to the word outrageous? Then maybe look into something similar to this design. A work of symmetry, this design is truly eye-catching as it not only features two revolvers but a grenade in the center to show off how explosive you are. Just because you are looking for a good gun tattoos, does not mean that you have to get something that is only one color. Some of the best tattoos ideas show off just how any guy can get a tattoo that is so eye-catching, onlookers are going to stop and stare at the beauty drawn across your arm. 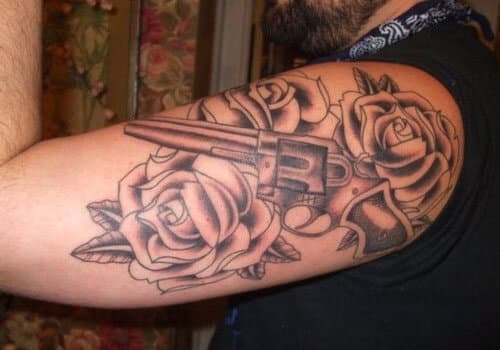 On this list, we have seen a lot of gun and flower tattoo designs for guys, and this is another example of how well the look works. The gun/flower juxtaposition leaves a lot of room open for interpretation. Even when getting something small, a design such as this one will stand out as a work of art. Just because you want a floral design does not mean it has to be small. Unlike the other gun/flower tattoo designs we have seen, this one stands out a good amount due to its size. One way to show off your love for firearms is to get a floral design that rests on those big biceps to make sure others see you are not messing around.